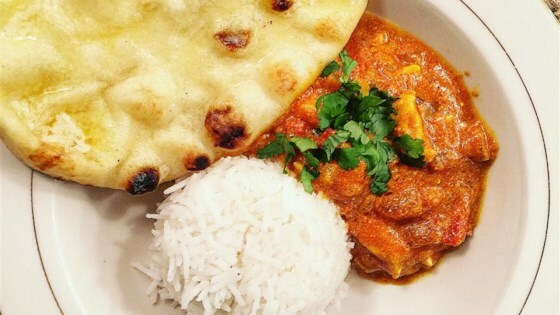 "This is a really good recipe for spicy Indian chicken curry. It's pretty easy to make and tastes really good!" Sprinkle the chicken breasts with 2 teaspoons salt. Heat the oil in a large skillet over high heat; partially cook the chicken in the hot oil in batches until completely browned. Transfer the browned chicken breasts to a plate and set aside. Reduce the heat under the skillet to medium-high; add the onion, garlic, and ginger to the oil remaining in the skillet and cook and stir until the onion turns translucent, about 8 minutes. Stir the curry powder, cumin, turmeric, coriander, cayenne, and 1 tablespoon of water into the onion mixture; allow to heat together for about 1 minute while stirring. Mix the tomatoes, yogurt, 1 tablespoon chopped cilantro, and 1 teaspoon salt into the mixture. Return the chicken breast to the skillet along with any juices on the plate. Pour 1/2 cup water into the mixture; bring to a boil, turning the chicken to coat with the sauce. Sprinkle the garam masala and 1 tablespoon cilantro over the chicken. Cover the skillet and simmer until the chicken breasts are no longer pink in the center and the juices run clear, about 20 minutes. An instant-read thermometer inserted into the center should read at least 165 degrees F (74 degrees C). Sprinkle with lemon juice to serve. I found this to be incredibly hot and strangely bitter. Absolutely delicious. We cut the chicken breasts into large cubes, which worked very well. Reduced salt by 1 tsp overall. Highly recommend this recipe. This always turns out great and gives me a wonderful feeling of satisfaction throughout the experience...be warned though, lay out and measure all the ingredients before turning on the burner!